Citizen Archivists must first register for a free user account in order to contribute to the National Archives Catalog. Register here. Once you are registered, login to your account. For suggestions of records to transcribe, browse our webpage of curated missions organized by topic. 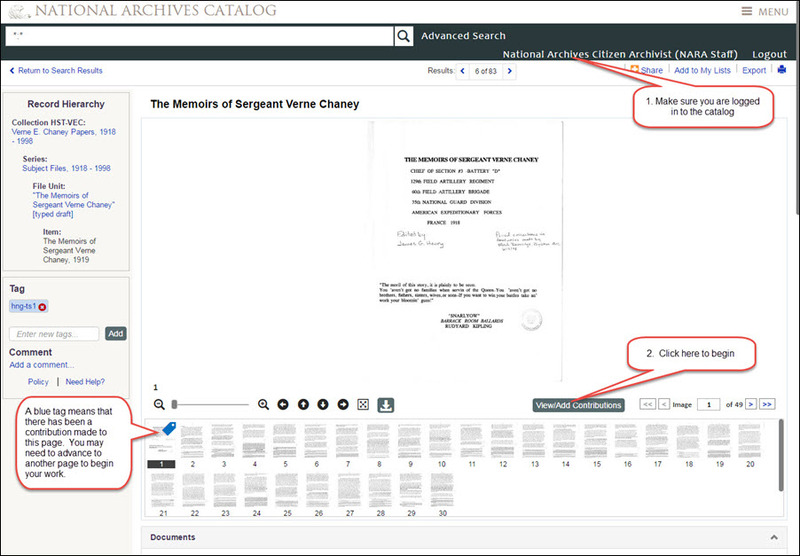 Click on a topic that interests you, and it will take you directly to a list of those records in the National Archives Catalog. At the bottom of the missions page, you will also see a list of featured records. Click on "Transcribe this record" to go directly to that record in the Catalog where you can begin transcribing. The following instructions detail the process of transcribing records in the National Archives Catalog. Once you find a record in the Catalog that you wish to transcribe, click on the title of the item to bring up the full record and description. This particular record contains multiple pages. Thumbnail images of all the record's pages are shown just below the image viewer. You may notice that some thumbnail images show a blue tag. A blue tag indicates that a contribution has already been made to that page. 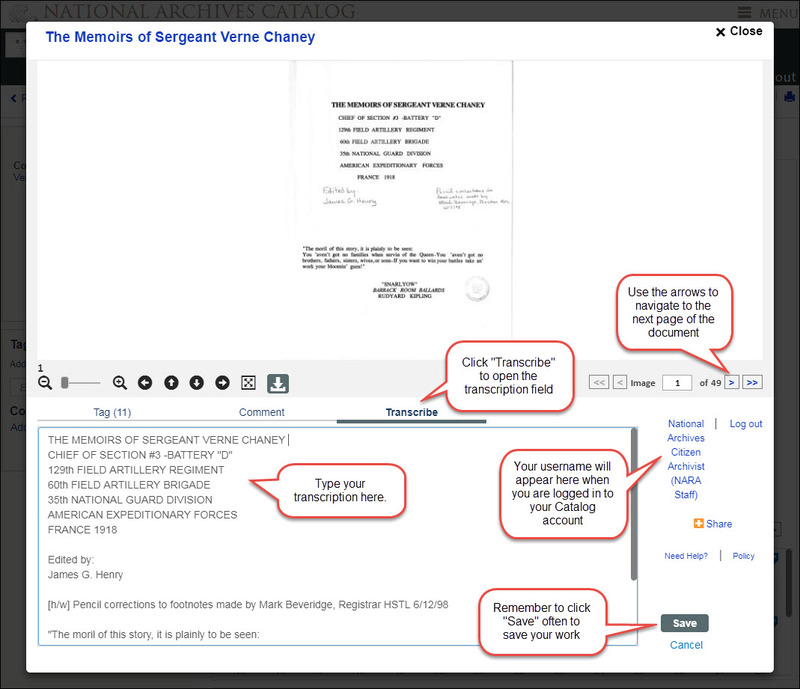 If you see a blue tag, navigate to the next available page to begin transcribing. Just below the image viewer, click on the grey "View/Add Contributions" box to open the contribution window and begin. In the contribution window, click on “Transcribe.” In this transcribe field, type exactly what you see in the document. Once you begin typing, a “Save” button will appear in the lower right hand corner. As you are working, we recommend hitting "Save" often to submit your work. This will save your transcriptions with the document. Once you are finished transcribing a page and have saved your work, use the arrows to advance to the next page to transcribe. Find a record with unique or tricky features? Read our Transcription Tips guide for examples and best practices for transcribing. Thank you for your contributions! Every contribution helps make the records of the National Archives more accessible to everyone. We encourage you to read our Citizen Contribution Policy. This page was last reviewed on October 17, 2017.